We saw our fair share of intriguing PC chassis in 2014, and when we think of those that stood out from the crowd, NZXT's H440 comes to mind. Soundproofed and forward-thinking, said chassis continues to be a go-to solution for high-end builds and is available today in a choice of colours for under £100. 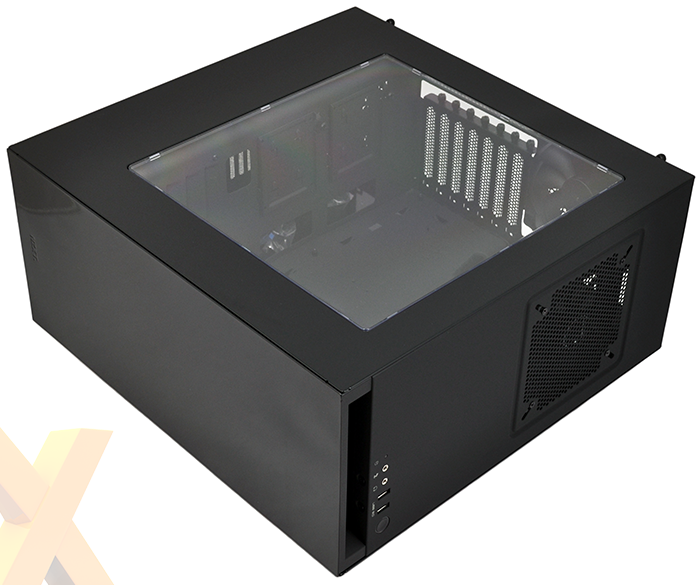 The H440 remains a solid option, but for anyone wanting to spend less, it's well worth diverting your attention to NZXT's lower-cost alternative, the Source 340 (S340), which is under the spotlight today. As part of NZXT's keep-it-simple range, the S340 carries an affordable £55 price tag and should offer a lot of what's good about the H440 without breaking the bank. Measuring 200mm x 445mm x 432mm and weighing a smidge over 7kg, the chassis is nice and compact for a mid-tower solution and that's thanks in part to NZXT's insistence on cutting support for legacy components. There are no optical drives to speak of, resulting in an interior cavern that feels roomier than the external dimensions let on. Aesthetically, the S340 is one of NZXT's more mainstream designs and is likely to appeal to a wider audience. 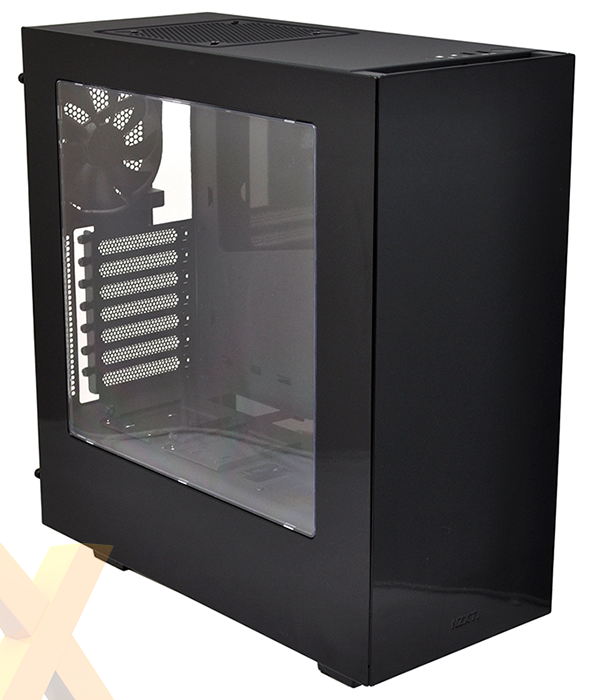 Our all-black review sample is sleek and stylish with a well-sized side window, though it seems NZXT couldn't resist a bit of jazz - the side and front panels are finished with very glossy paint. A white variant is also available for those looking to make more of a statement, and in recent weeks matte-black options have also been released with blue or red highlights. The S340 isn't as eye-catching as the H440, which may be a good thing, yet it's a good-looking case and the overall build quality belies the price tag. 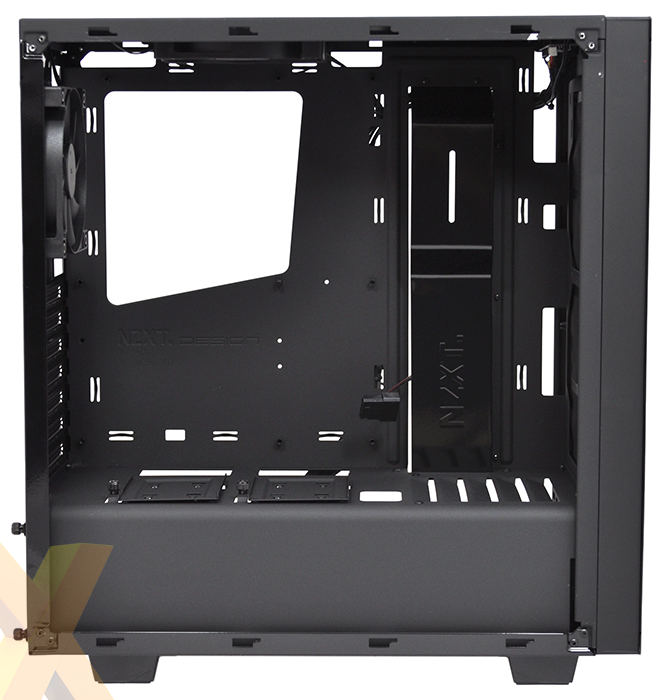 Whereas other chassis at this price point can feel overly plastic, NZXT's mid-tower touts a 90 per cent steel construction and feels reasonably sturdy throughout. In an effort to streamline the exterior look, the solid front panel is uninterrupted save for a small NZXT logo near the foot of the enclosure. 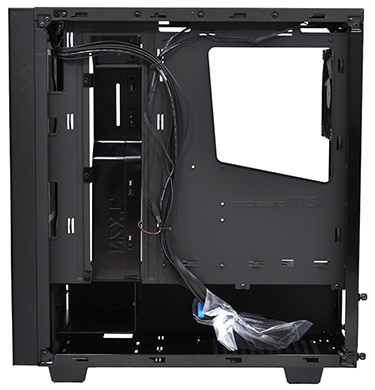 Streamlined panels looks the part but a solid front isn't ideal for chassis airflow, and the S340 aims to minimise any such issues by incorporating a one-inch gap between the front panel and the central steel structure. A minimalist I/O panel is located on the top edge and includes two USB 3.0 ports, audio jacks and a backlit power button. There's no reset switch, which seems a strange oversight, and underneath the case, the removable dust filter that covers the PSU bay is basic but serviceable. Removing the notched, thumb-screwed side panels reveals a better look at the S340's capabilities. 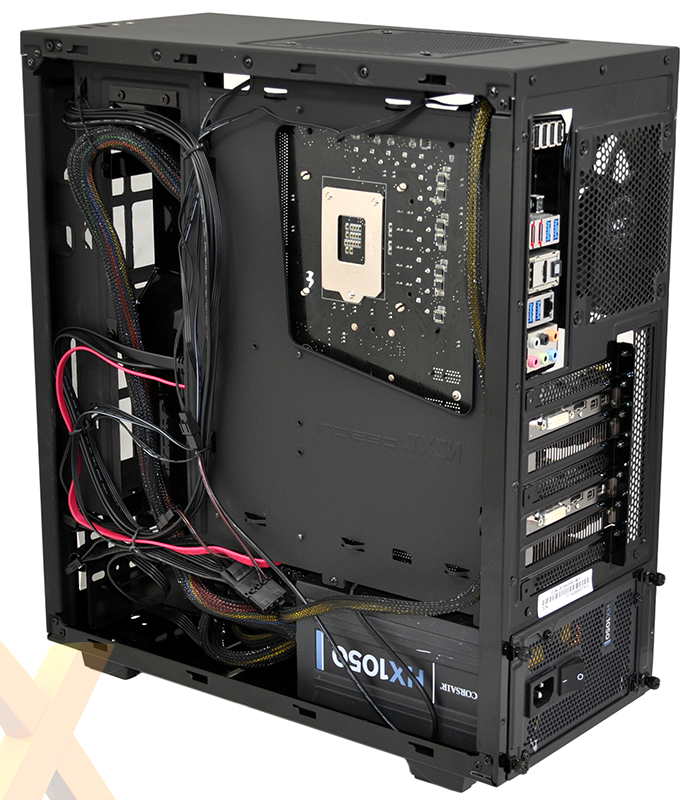 We can see support for Mini-, Micro- or standard ATX motherboards, a good-sized cutout in the motherboard tray for CPU cooler installation, a compartmentalised PSU bay and a relatively straightforward storage system. NZXT has two 3.5.in hard-disk bays situated at the end of the PSU compartment, and on top there are two removable 2.5in drive trays positioned to ensure your high-speed SSDs don't go unnoticed. It's a very clean layout though you will have to be considerate in order to keep it that way. During use, we found that the matte interior and side window had a tendency to scuff rather easily, so be sure to take a little extra care when building into the case. Elsewhere, dual three-pin fans are supplied as standard - 120mm exhausts at the top and rear - and there are no front intakes in the default configuration. 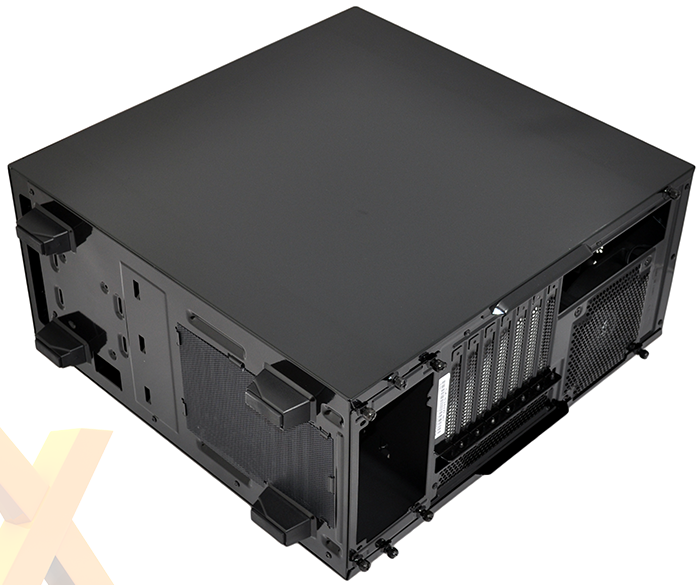 NZXT reckons the front of the chassis is best left clear for an end-user radiator, and has made provisions in the form of dual 120/140 mounts. 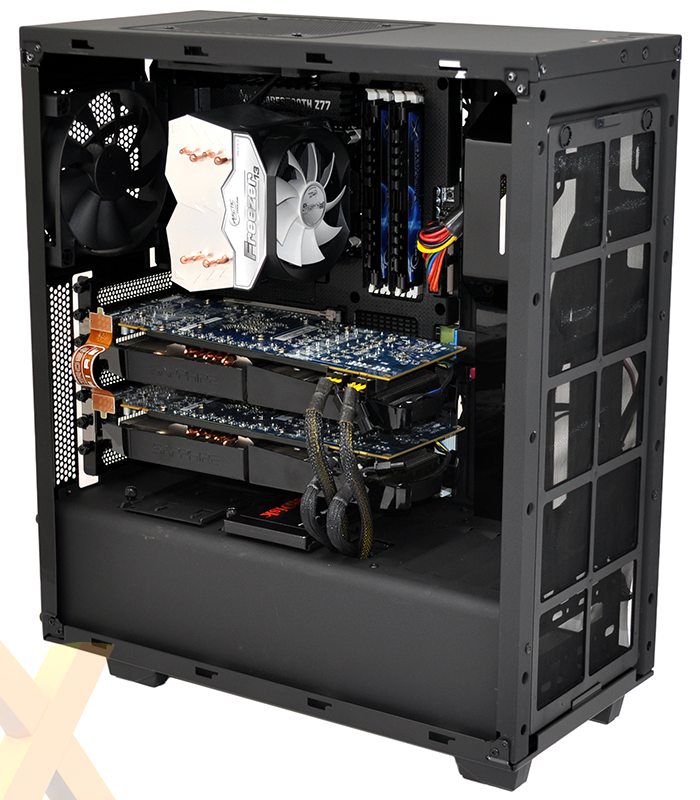 End users contemplating a high-end cooling configuration may be wondering where a fan controller would fit. That's a good question considering the S340 has no 5.25in bays, but NZXT does have an answer in the form of its own GRID+ digital management system. 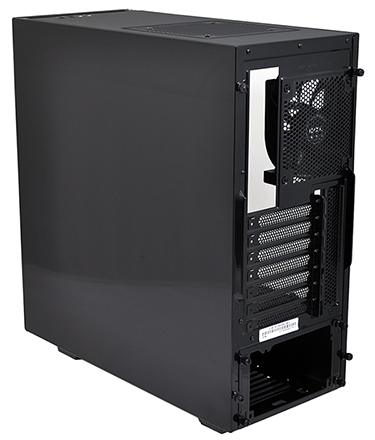 The chassis doesn't look all that big, yet our dual-graphics Intel Z77 test platform slots in with consummate ease. There's 161mm of CPU clearance and graphics cards measuring up to 364mm in length are supported. Note that the latter is reduced to 334mm clearance when a front radiator is installed. Given the size of the case, and the relatively low cost, we were surprised at how rewarding the S340 is to work with. High-end components fit in with no fuss, cable management is excellent, with more tie-down points than you're likely to need, and the end result is a build that looks admirably smart. The angular frame is ripe for modding, we feel, and the side window is great for showing off your wares. 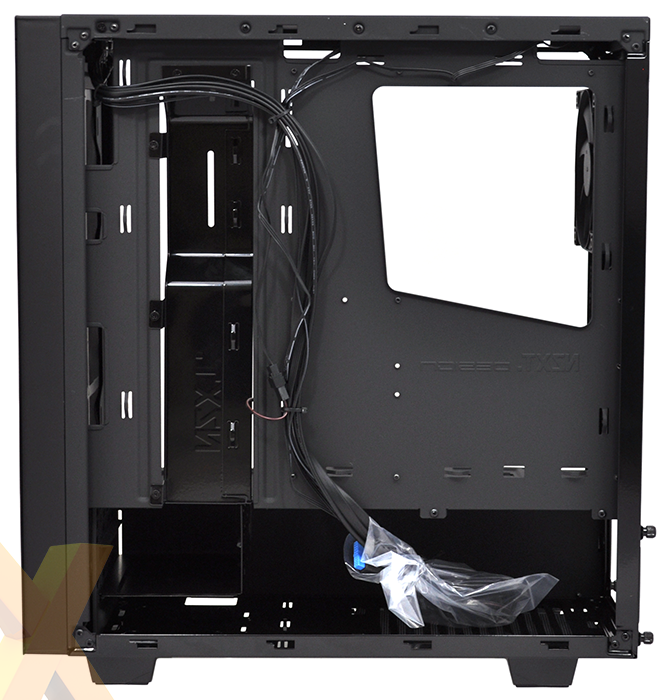 We're particularly impressed with how easily cables are routed - the holes above the motherboard tray are a good size, it's easy to pass cables through the PSU compartment, and the offset column alongside the tray does a good job of hiding cable clutter. Without pushing the boat out, the S340 gets a lot of the basics right and we like the fact that NZXT is paying attention to the little details. There's a pamphlet included in the box explaining how to install Windows without an optical drive, and an online 'How To Build Your Own PC' guide is another good example of NZXT going the extra yard.